Éditions Dédicaces, a 2 year old French-Canadian digital publisher, have just started taking orders for their own branded ebook reader. The ER-009d is based on a 4.3" (480x272) LCD screen and it has 2GB Flash, a microSD card slot, a touchscreen, microphone, speaker, and 7 hours of battery life. It ships with 300 public domain titles in French, as well as 65 contemporary titles (published by Éditions Dédicaces) and 25 audiobooks. I'm not sure that the image at right is actually the correct ereader; the unit demoed in the video looks very different. I'm also not sure if it supports DRM. The complete format support isn't listed, but it includes a pretty decent swath of audio, video, and ebook formats. This is the second ebook reader to be released by a publisher, and it looks like it might actually hit the market first. You can pre-order it now with a price starting at $100 CAD. The price will go up as more people order it, and if there are less than 200 orders then it won't ship. If I had to make a guess, I would say that this is a RockChip design. The format support and general menu design suggest that CPU maker was involved. So will it succeed? 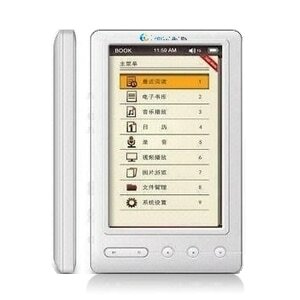 The $100 price point is quite crowded now, and you can find any number of refurbished ebook readers for less than the ER-009d. On the other hand, none of those cheaper ereaders come with as many ebooks as this one. People are only charged if the requested amount of 5 devices is reached on Ulule. If you want to be sure to buy and receive the eReader, you can order it on our website : http://www.dedicaces.ca/ereader.html. The demo starts at about 0:50. The image is not exactly the same but this is the same device. The eReader include a calendar, a notepad, bookmarks, a radio and some games. It is not refurbished. Our eReader is a new one.